One of my favorite parts of the pizza is always the crust. I love the crust and if it not good the pizza just isn’t as enjoyable. 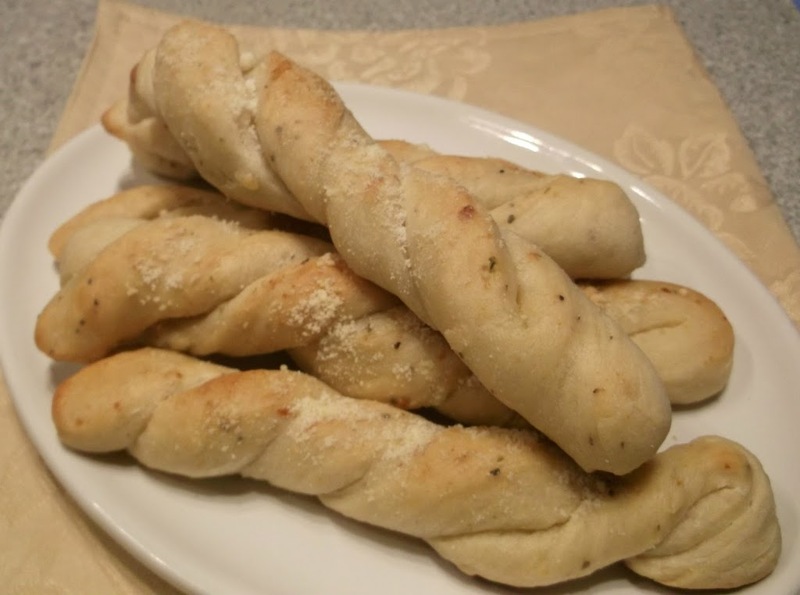 That is why I wanted to make fresh breadsticks for my slow cooker pizza dip from my last post. I wanted a breadstick that would be soft and easy to eat with the pizza dip. But I also wanted to have a breadstick that would enhance the flavor of the pizza dip as well. That is why I added a little garlic powder, oregano, and Parmesan cheese to the bread dough. I have discovered that adding some herbs and cheese to my bread dough makes a nice yummy flavored bread. 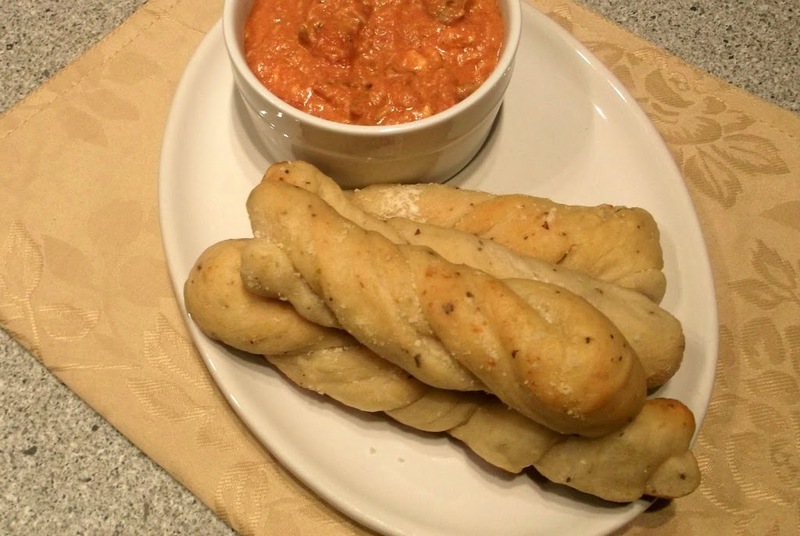 The breadstick turned out to be delicious and went very well with the pizza dip. In my last post I mentioned that I made the pizza dip and the breadstick to take to my brother’s birthday party. I got rave reviews from everybody at the party, except for my mom. I usually make a chili dip for parties and my mom said that she liked my other dip better. But the other people that tried my pizza dip told me they really enjoyed it. I guess you can’t always please everyone. In a large bowl combine the water, yeast, and brown sugar, stir until well combined. 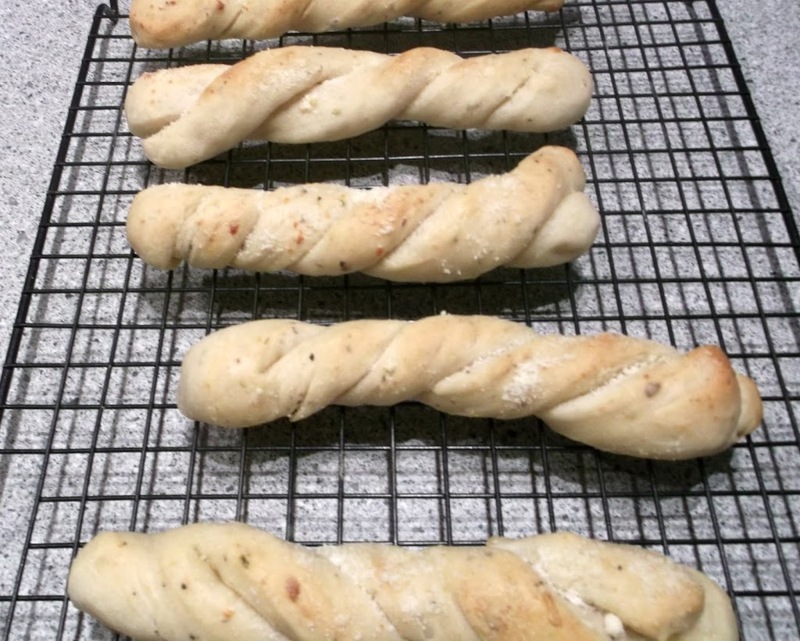 Once the yeast is dissolved add the olive oil, 1 cup of flour, salt, garlic powder, oregano, and Parmesan cheese. Stir the mixture until well blended. Add another cup of flour and by hand start mixing the flour in. As the flour is kneaded in continue to add the rest of the flour. The dough should be just a touch sticky. Grease the bottom and side of the bowl and turn dough to coat all sides. Place in a warm place and let rise until double in size about 1 hour. When the dough is doubled divide into two balls. Take one ball of dough at a time and pat it into a 11 inch long by 7 inch wide rectangle. Take a pizza cutter or a sharp knife and cut into strips about one inch wide starting on the short side of the rectangle. Taking one strip and roll into a rope about 12 to 14 inches long fold in half and twist the two strands together to make a braid. Place on greased baking sheet and let rise until doubled about 30 minutes. Bake in a 375 degree F oven for 12 minutes. Remove from oven brush with olive oil and sprinkle with Parmesan cheese, place back into oven and continue to bake an additional 2 to 4 minutes so the bread is slightly brown over top. Cool on wire racks. Perfect to dip in your pizza dip! It’s freezing here today. Can’t imagine anything better than the smell of fresh breadsticks baking in the oven:) Happy Weekend!